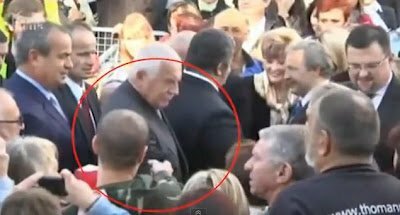 Footage of the incident from Czech channel TV Prima shows Vaclav Klaus recoiling slightly but carrying on with the visit apparently unhurt. Vaclav Klaus was taken to hospital but suffered only minor bruising. His security detail has come in for harsh criticism for allowing the man to get so close to Vaclav Klaus. It is also unclear why Vaclav Klaus’ bodyguards failed to react when a gun was pulled on him. Vaclav Klaus himself rebuked them for failing to handle the situation well, according to the Nova TV station. The attacker, who was dressed in camouflage clothing, pushed his way through a crowd in the town of Chrastava before firing the weapon at Vaclav Klaus. The weapon was of the sort that is used in “airsoft” gaming. The man was briefly interviewed by Czech media and said he was a 26-year-old communist sympathizer. Vaclav Klaus has been in the largely ceremonial post of president since 2003 and previously served as prime minister in the 1990s. He is known for pushing through reforms to the Czech Republic’s economy after the fall of Communism and is a staunch opponent of EU integration. How long do human fingerprints last?